The strikes at Auto-Lite in Toledo in the spring of 1934 secured a victory for the fledgling Automobile Workers Federal Union Local 18384 of the AFL and permanently altered the nature of worker-employer relationships in Toledo. This victory assured that working men and women in Toledo would have some power over their working lives and a voice in their community. Workers in Toledo today owe a debt of gratitude to the "unholy thirteen" who huddled over the fires burning in drums in front of Auto-Lite and who dreamed of freedom and dignity. And as today grows out of yesterday, so the workers in 1934 faced a set of conditions and attitudes shaped decades before by the industrial evolution of Toledo, the development of the automobile industry, and the historical struggles of their ancestors. In the twenties, some workers at Auto-Lite had discussed the possibility of forming a union, but nothing had materialized. The nature of production work in a factory created in many minds—particularly in the minds of craft union advocates—an insuperable obstacle to forming a union. The factory operative enjoyed no inherent power, for he or she could be moved from job to job or speedily replaced because the machine performed the skilled functions while the operative tended it. The parts industry, like the automobile assembly industry itself, experienced the seasonal cycle of production and lay-offs, even in the best of times, so operatives at Auto-Lite faced constant uncertainty. They understood their vulnerability: employers could dismiss a worker at will or refuse to rehire a worker who got out of line. Forming a union in the twenties and thirties proved fully as out of line then as now Workers at Auto-Lite lived with fear and uncertainty, for with the exception of the model shop and related operations where a few workers made new products and cut dies, the Auto-Lite employed operatives almost exclusively. One need not look far to understand their reluctance to take the risks of forming a union. In 1933, a few workers from Auto-Lite's Department Two, the punch press room, notably Charles Rigby, Lester Byrd, Chester Dombrowski and John [J. J.] Jankowski, began to act upon their belief that semi-skilled factory workers should and could form unions, and they approached the Toledo Central Labor Union for advice. Although sympathetic, no single craft union found them within its jurisdiction. Factory operatives simply did not fit the craft form of organization. Rigby and his friends were referred to a new Federal Labor Union, which had recently formed in Toledo. Federal Labor Unions appeared in the AFL well before 1933. Produced by the debates between craft union advocates and industrial union advocates, the Federal Labor Union provided the structure to organize entire industrial plants or complexes. During the initial organizing period, all workers, regardless of skill or work assignment, would be recruited into a single Federal Labor Union chartered for a particular plant or factory system. Once organized, workers would be assigned to new or existing locals of the appropriate craft international. The organizers initially targeted Spicer Manufacturing Company, Bingham Stamping and Tool Company, Logan Gear Company, and City Auto Stamping Company. Through Rigby and his friends, the Auto-Lite, one of the largest employers in Toledo, joined the list, Membership from Auto-Lite, initially small, included strong and imaginative leaders. Local 18384 had an unusual jurisdiction that included a number of distinct companies. Normally, a separate charter would have been issued for each, but Local 18384 covered five companies, each with its own shop committee to direct plant affairs. The officers reflect the atypical composition of Local 18384. When Lawrence D. Haynes, the first president of Local 18384, found a new job in Detroit in early March of 1934, the members declared the office vacant and elected Floyd L Bossier to fill it. Bossier did not work at any of the plants in Local 18384's jurisdiction. A city employee in the street department, he had built a reputation in Toledo by speaking on socialist themes and by campaigning actively for the new mayor and former Socialist, Solon Klotz. However, members of the Auto-Lite shop committee sat on the executive committee of the local—William Siefke, for example—and the local's financial secretary, George Addes, also came from Auto-Lite. Other officers and executive committee members came from the remaining four companies targeted for organizing. Thomas Ramsey, business agent for Local 18384, worked at City Auto Stamping. This reflected the nature of work in the auto parts business. The worker followed the work, sometimes from plant to plant around the city. From August 1933 to February 1934, Local 18384's activities grew from a series of furtive, secret meetings in workers' basements to open meetings attracting a few hundred workers at the rented Moose Hall. There, in February, the membership decided to strike Spicer, Bingham, and Logan to enforce the union's demands for recognition, wage increases, and a seniority system. Members of the Auto-Lite shop committee insisted that Auto-Lite be included, although the union had little active support there. Charles Rigby, chairman of the Auto-Lite shop committee, argued persuasively that a strike there could be effective since union supporters dominated the punch press room, Department Two, which made the stampings for the entire assembly operation. This obvious tactical advantage convinced Local 18384's executive committee to include Auto-Lite in the strike; and it agreed to continue the strike at Spicer, Bingham, and Logan until Auto-Lite settled. On February 23, Local 18384 struck Spicer, Bingham, Logan, and Auto-Lite. Production at Spicer, Bingham, and Logan slowed significantly as a result of the strike, but at Auto-Lite production continued unabated. On the morning of February 23, fifteen workers out of Auto-Lite's work force of fifteen hundred clustered with their picket signs and union badges around a fifty-five gallon drum salamander in front of the factory on Champlain Street, watching the mass of workers report for work. Support by strikers at Spicer, Bingham, and Logan, who refused to return to work unless Auto-Lite reinstated its strikers, sustained them. The handful of strikers huddled around fires in late February surely felt the chill of winter; but just as surely, they felt chilled because they were so few in number. Fear thawed from their faces four days later, however, when they won an agreement and reinstatement. On February 28, the strike ended, The Auto-Lite strikers returned to work under a thirty-day agreement, knowing they had survived where others had not but fully aware of their precarious situation and of the immense organizing task before them. They had achieved an important moral victory, for they demonstrated to their fellow workers and to themselves that Auto-Lite was not invincible. Assuming that they had won recognition, the Auto-Lite shop committee arranged meetings with management. The meetings quickly demonstrated that Auto-Lite had merely acknowledged the existence of Local 18384 but did not recognize it as the bargaining agent for Auto-Lite workers. The nucleus of workers in the punch press room, building upon their successful reinstatement, signed up workers in anticipation of the inevitable showdown. The company also prepared by adding new workers to the force and, more ominously, by secretly purchasing tear gas and arms from Federal Laboratories, a munitions manufacturer. The April 1 deadline of the February agreement passed without a contract, but the union continued to try to negotiate. On April 12, six weeks after their modest victory, the membership voted to strike; and on Friday. April 13, approximately four hundred Auto-Lite workers set up picket lines. An equal or greater number of workers crossed the picket lines, entering the factory without serious incident. The strike appeared to divide the work force equally, but many new hires were among those entering. The company responded by increased hiring, replacing those workers who had struck. Minor incidents, such as pushing. shoving, and some fist fights, occurred on the picket lines and at homes around the community when union members tried to persuade those still working to join the strike. From the first day of the strike, the Toledo Police Department assigned officers to patrol the picket lines, but they made no attempt to disperse the picket. The picket lines rallied strikers, kept their spirits high, preserved their solidarity. and generated fear and guilt in those who sought to cross them. Workers from other plants around Toledo and from other unions joined Auto-Lite strikers on the picket lines, as did members of the Lucas County Unemployed League, which had been organized in 1933 by members of the American Workers party. Thus, the picket lines became a major target of the Auto-Lite management, which went to court to attack them. On May 3. counsel for Auto-Lite appeared before Judge Roy R. Stuart in the Court of Common Pleas seeking injunctive relief from the pickets. Bringing the case before the Court of Common Pleas invoked the county's jurisdiction. Judge Stuart granted the injunction and limited pickets to twenty-five. He assigned responsibility for enforcement to Lucas County Sheriff David Krieger, a Republican who had run for office with the support of C. O. Miniger, president of Auto-Lite. Krieger began to hire special deputies to enforce the injunction. He did not require previous police experience for the job. The deputies dressed in street clothes and wore only arm bands and badges to identify themselves. Auto-Lite paid their wages. Fifty Toledo police force members had recently been laid off because of the city's strained financial situation, but none joined Krieger's force of special deputies. On May 5, leaders of the Lucas County Unemployed League announced in a public letter to Judge Stuart that they intended to violate the injunction against mass picketing. Two days later, as the leaders picketed Auto-Lite, Sheriff Krieger arrested them and charged them with contempt of court. Judge Stuart convicted them but then suspended their sentences and released them. They returned to the picket lines, where they were joined by dozens of union members who had also agreed to break the injunction. Additional arrests ensued; but in large measure the league and the union defeated the injunction, for the city and county, unable to handle mass arrests, had to release the pickets shortly after their arrests. The pickets quickly lost whatever respect they had had for the sheriff and the courts. Ironically, the injunction proved crucial, for the strike seemed doomed until its issuance. Auto-Lite operated with non-strikers supplemented by the newly hired. Although less efficient, production of generators, meters, and gauges continued. In addition, some strikers filtered back into the plant. However, the hated injunction had aroused the strikers. Their ability to break the injunction in fact, if not in law, encouraged other workers in the community to join them, and the picket lines swelled. Auto-Lite remained intransigent. It intended to break the picket line. When crowds of up to six thousand rallied in front of Auto-Lite on May 21, 22, and 23 to hear speakers from the American Workers party and the union. Auto-Lite hastily added to its cache of arms. The company encouraged Sheriff Krieger to enforce the injunction more energetically. Adding to his force of special deputies, which now included Auto-Lite workers who remained at work and scabs, Krieger set out on May 23 to disperse the pickets. He stationed deputies well supplied with tear gas on the roof while others were stationed in front of the plant. The subsequent melee began when someone threw a heavy steel bracket from the building and hit a female picket, Alma Hahn, in the ear and neck. Outraged, the pickets surged forward and attempted to storm into the building to attack the person who threw it. The special deputies fired tear gas down on the pickets, who then fell back across the street. News of the fighting quickly spread across Toledo and attracted larger crowds. Attendance at movie houses declined as the Auto-Lite strike became the most exciting show in town. The Auto-Lite factory also became a symbol, a target for Toledo workers' pent-up exasperation, frustration, and anger. The strikers, determined to halt production at Auto-Lite, surrounded the factory on the afternoon of May 23 and refused to let the strikebreakers out when the shift ended. Strikers, sympathizers, and children from the area showered the factory building with bricks and stones until no window remained unbroken. Managers herded the strikebreakers into the adjoining building behind the main plant where they spent the entire night in darkness and terror. The special deputies soon exhausted Auto-Lite's stockpile of tear gas, so an emergency call went out to Cleveland for additional supplies. The crowd overturned cars and set them afire as they dodged tear gas canisters and projectiles. Frantic calls for help from inside the factory persuaded the governor to intervene, and, at midnight, units of the Ohio National Guard were mobilized and sent into Toledo. They arrived at 4:30 in the morning, deployed on Michigan Avenue two blocks away, and marched to the plant, dispersing the crowd as they advanced. Within hours, the guardsmen had moved the crowd back and had taken up positions, setting up machine gun emplacements at key intersections near the plant. At 7:30 that morning, the guard released the strikebreakers and escorted a bus carrying some of them away from the building. The guard ended the siege of the Auto-Lite factory, but it did not end the struggle. The crowd remained, restless and hostile. The young, frightened, and poorly-trained guardsmen failed to intimidate the crowd. Rocks and bricks soon accompanied the taunts and insults passing back and forth across the picket lines. On Thursday afternoon, May 24, a full battle between guardsmen and the crowd erupted in front of the Auto-Lite factory. Guardsmen hurled back rocks thrown from the crowd, also pausing to throw tear gas canisters and to fire tear gas shells. Members of the crowd donned gloves to hurl the tear gas back into the guardsmen's ranks. With fixed bayonets, guardsmen charged into the crowd repeatedly, only to retreat again as the Battle of Chestnut Hill raged back and forth in front of the factory. During one charge, guardsmen fired, wounding more than a dozen and killing Frank Hubay, a young unemployed worker who had once worked for Auto-Lite. But the gunfire did not disperse the crowd. Later that night, guardsmen fired again and wounded two more. The adjutant general of the guard, Frank D. Henderson, ordered the nine hundred guardsmen reinforced, bringing the total on duty at Auto-Lite to 1,350. Friday, May 25, saw no serious encounters; but on Saturday, amid union demands that the plant close completely and the guard with-draw, a crowd of five thousand clashed with the guard. Two hundred were injured and fifty arrested. The following week the plant remained closed. No further violent confrontations occurred as federal mediators, the company, and the union attempted to work out an agreement. Auto-Lite suggested that the Automobile Labor Board, which President Roosevelt had appointed on March 25, be asked to intervene; but Local 18384, sensing victory, rejected the suggestion. On Friday, May 31, the guard with-drew, and an agreement negotiated directly between the union and Auto-Lite management emerged. On June 4, the union ratified this agreement in which Auto-Lite recognized Local 18384 as the legitimate bargaining agent for its members. On June 5, the Auto-Lite plant reopened. However, Local 18384 did not win an unqualified victory. The order of rehiring placed strikers second in importance to old employees who had remained at work during the strike, and it secured bargaining rights only for its members. Shortly before the strike, some workers who aligned themselves with Auto-Lite management formed a competing organization called the Auto-Lite Council. Management recognized this company union's bargaining rights and gave them priority in rehiring. The order of rehiring created few difficulties in practice, however, since virtually all old workers were rehired at the same time, striker and non-striker alike. Newly hired strikebreakers found themselves ignored, and many were not rehired until months later when production began to accelerate. The Auto-Lite Council hung on for two more years; but Local 18384 won the real victory, of course, for its recognition established the basis for collective bargaining. Auto-Lite workers understood this and rushed to join Local 18384. Within months, the Auto-Lite Council was a paper organization. Preferential treatment that Auto-Lite management promised council members never materialized, and its members realized that they could expect no more in their negotiations than the union already had won. Local 18384's success in establishing a conventional collective bargaining relationship with Auto-Lite management failed to fulfill the hopes of the leaders of the American Workers party, the Communist party, and other radical supporters of the strikers who had seen in the Auto-Lite strike the potential for a more dramatic and revolutionary outcome. Likewise, the plan of the AFL leadership to distribute the membership of Local 18384 among existing craft unions never reached fruition because the CIO formed in 1935. Local 18384 then evolved into Local 12 of the United Automobile Workers, CIO. Members of Local 12 became leaders of the UAW and supported the organization of other strikes such as the Chevrolet transmission plant strike in 1935 and the great Flint sit-down strike of 1936-1937. Ultimately, Auto-Lite closed because the expanding assembly companies began to produce their own parts and no longer needed Auto-Lite. In the fifties, Ford Motor Company bought the Auto-Lite name and some of its patents. In the early sixties, the Toledo plant and its remaining operations were absorbed by a conglomerate. The Auto-Lite factory on Champlain Street, scene of the tragedy and triumph of 1934, closed its doors in 1962. When the following interviews were conducted in 1973, the building stood virtually abandoned, a store-house for industrial implements. When Auto-Lite closed, the workers, many of whom had struggled there in 1934, were given the option of retirement or transfer to other plants far from Toledo. Some, who had lived in Toledo their entire lives, did transfer to protect their small pensions. Others remained, unwilling to disrupt their lives. Some received pensions of thirty to fifty dollars per month after working for Auto-Lite for thirty or more years. Some received no pensions at all. Although Local 12 was able to find jobs for some Auto-Lite workers at other plants it had organized, it could not do so for all. Thus, it confronted the central assumption unions make and also discovered the limits of its power: unions assume that the employer wants to remain in production. When an employer does not wish to remain in production, a union cannot force him to do so. If an employer chooses to discard a factory and cease production, he can do so. Therefore, many Auto-Lite workers found themselves unemployed: too young to retire and too old to hire. Discarded much like old industrial machinery, these workers had to subsist on small pensions and on Social Security. even today, the only real power workers have is the power of their solidarity. Therefore, loyalty to one's brothers and sisters in the move-ment becomes the essential virtue. The importance of this loyalty helps to explain the intensity of commitment and also the rancor that divisiveness created at Auto-Lite. Loyalty arose on both sides at Auto-Lite. Union organizers appealed to a felt, common plight on the job and to class solidarity. They declared that mutual loyalty among workers would generate the unity necessary to improve working life and to secure their dignity and freedom. If they stuck together, they could win. Conversely, the company identified the organizers as a small group of malcontents not really part of the corporate family and who were even considered "outsiders." Managers appealed to the workers' sense of loyalty to the company as the supplier of jobs, of livelihoods. The company made clear the consequence of joining a union that peers had created. Unions represented disloyalty and thereby removed one from the family's protective embrace. For some workers, that appeal proved persuasive, notably for those who internalized the company's viewpoint and who believed that unions disrupted the harmony of industrial life. Some also carried with them a vague sense that unions were somehow illicit. (1) that employees shall have the right to organize and bargain collectively through representatives of their own choosing, and shall be free from interference, restraint, or coercion of employers of labor or their agents, in the designation of such representatives. .
(2) that no employee and no one seeking employment shall be required as a condition of employment to join any company union or to refrain from joining, organizing, or assisting a labor organization of his own choosing. . . Although unenforceable and unclear (even allowing the formation of company unions dominated by management), the act suggested that government approved unions. The act, therefore, had a psychological impact far greater than its legal precedent. No organizer in Toledo declared, as organizers did elsewhere, that "President Roosevelt wants you to join a union"; but the act's implications encouraged key organizers to act, and thousands of workers responded. Without doubt, company assertions that unions were not respectable lacked credibility. The act also discomfited workers who had hidden behind feelings of helplessness that rationalized doing nothing. The act compelled them to confront the reality of their conditions and to recognize that they could legitimately act to assert their dignity and freedom. The federal government certainly did not play an activist role in Toledo on behalf of organizing efforts; but Section 7(a) lowered one barrier to organization and encouraged workers to unite and to seek negotiating meetings with management. The inconclusiveness of such negotiations, however, convinced workers that the law would ultimately be enforced only through their own united efforts. Additional stimulus for organizing came from leftist political parties, such as the American Communist party, the Socialist party, the Socialist Workers party and the American Workers party. Members of the Conference for Progressive Labor Action and graduates and staff from Brookwood Labor College founded by A. Muste also focused their attention on Toledo. Trained at Brookwood as organizers, they used their skills to help raise the consciousness of Auto-Lite workers. They not only counseled strike leaders but actively supported them through innovative organizations such as the Lucas County Unemployed League, which rallied potential strikebreakers in support of the strikers. The crushing weight of the Great Depression on the industrial worker also created conditions that lead to the strike, Some Americans, assuredly, scarcely felt the depression and others eluded its debilitating effects; but industrial workers felt its full weight. Wholly reliant upon wages and a steady job, they quickly felt the disintegration of business activity. Possessing modest skills and easily replaced, they found themselves in constant competition for survival with other desperate men and women. If unemployed, they were forced to seek others' jobs. If employed, they could feel hungry eyes on themselves. The resultant uncertainty and anxiety permeate the interviews in this book. If a strike failed, overt union sympathizers would surely lose their jobs and would likely be blacklisted. Relief—charity, in the view of many—was demeaning and clearly a final, desperate measure. Nevertheless, these deep anxieties did not defeat the movement toward unity and organization. Those who overcame their fears, who took the risk, live vividly in the memories of the men and women who will speak to us in this book. The workplace itself, where these men and women mingled, where they earned their bread and discovered the ties of solidarity, compels our attention as it controlled their lives. The conditions they encountered— the character and posture of their supervisors, the pace of their work, the nature of the machines they operated—all helped create environment conducive to organizing. As long as resentment troubled only the individual, it could be isolated and rendered harmless. Consequently, the first organizing step required breaking down that isolation and generating awareness of a common plight. What was the common plight of the Auto-Lite workers? How did Auto-Lite deal with its employees? What was the workplace like? What did it feel like to be an employee of Auto-Lite? Workers and managers alike will answer questions such as these in the interviews. Clearly, loyalty among workers at Auto-Lite proved more powerful than a sense of obligation to company managers. Personal bonds among a few men who worked in the same small department created the initial unity, but trust and faith had to spread broadly throughout the plant for organizing to succeed. A modest success—simple reinstatement after the February strike—provided the encouragement; personal bonds and peer sympathy then brought workers together. This reconstruction of events and review of issues in the 1934 strike at the Auto-Lite factory provides a context for the personal recollections that follow. (See Appendix A: The Narrators for a descriptive listing of the individuals who contributed oral histories to this book) The complexity of such an event, coupled with differing individual experiences and points of view, emerges in the oral histories that complete this volume. These oral histories help create an understanding of the human drama of such a strike, of the hundreds of personal decisions and actions which made it live. Many of the people interviewed for this book have passed away; but much to our good fortune, their stories survive. They are not illiterate; but many have not, generally, expressed in writing their fears and hopes, their attitudes and sentiments. Because our culture relies so heavily on written documents to define historical reality, the experiences of these people are often shared with only a few. Some are not shared at all, and we are the poorer for it. 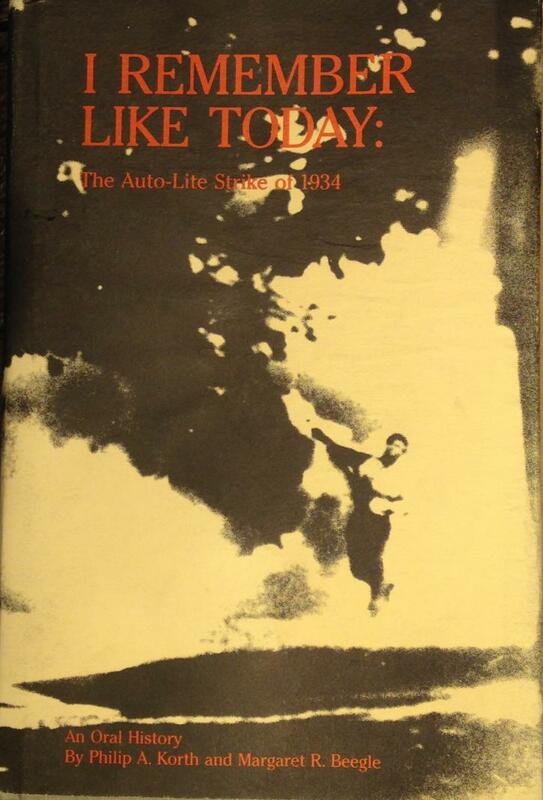 This book aspires to save some of those experiences and to enrich our understanding of the Auto-Lite strike of 1934.